My good friends from church, Josh, David Jackson, Big Sammie and I decided to do this hike on Dog Mountain in honor of Josh and his then fiancé, Eris, getting married just a few days later. I was a little hesitant because the weather was really rainy and I usually don’t intentionally plan a hike in the rain, but like I said, Josh was just about to get married and he was up for it, so we did it. We started out pretty late, probably around 2:30pm or later from the trailhead. I hadn’t done a serious hike in a really long time, and I felt it. It was a pretty steep trail. Sam said the elevation gain if we made it to the top was 2,500 feet or so. 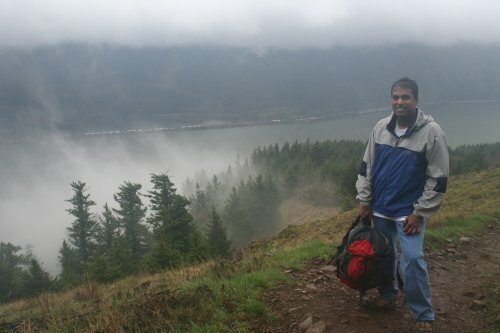 Most of the hike was well forested which sheltered us from the high winds and rain to a certain extent so we just got a kind of consistent drizzle for the majority of the hike. 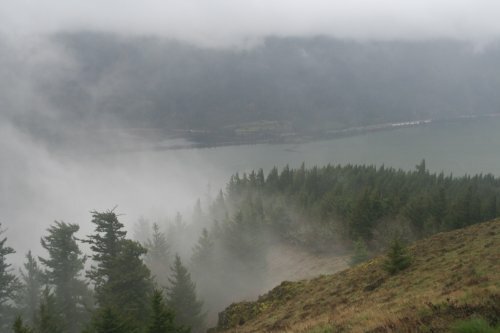 Along the trail there were two or three viewpoints at clearings that had different levels of visibility in the rain and fog. Most of my photos are from the first one we came to, which probably had the best view of the day. In the end we made it just past a large meadow that surrounded a long straight and steep exposed section of the trail, to a viewpoint that we guessed was perhaps 500 feet in elevation or so from the top. This exposed section was so windy–I would guess maybe 40 or 50 miles per hour, but I could be wrong–and some of us (me, particularly) were so tired, we decided to head back from there rather than continuing to the top. We decided we would do the hike again once the weather was more Spring-like and the flowers in the meadow were blooming and then we would go all the way and enjoy the surely spectacular view. 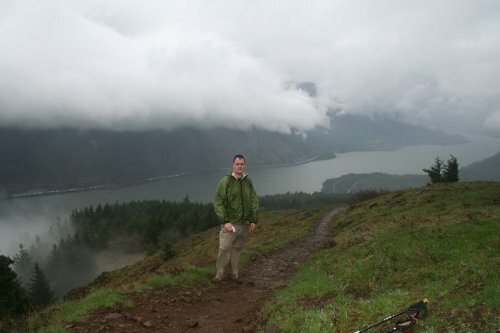 All in all it was a good experience, and from now on I won’t be so hesitant to hike in the rain. 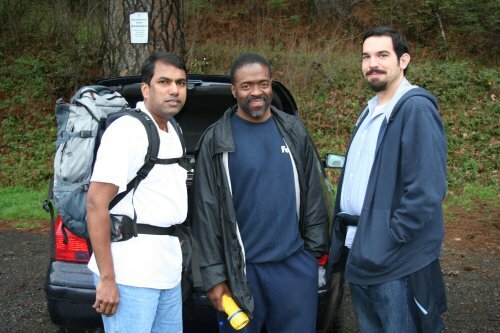 This was--from left to right--Sam, David Jackson and Josh in front of my car at the trailhead parking lot before the hike. We didn't pick the best day for the hike as far as weather goes. It was rainy and very windy the whole time, so I didn't take too many photos, but on the way down Sam and I stopped at this viewpoint which I would say is maybe about at the half way point or so--the first major viewpoint you come to--and I took a few photos. This one and the rest you will see are from this spot. Despite the cloudy, rainy weather, the view was not too bad. Notice the train by the highway on the other side of the river. In real life it was really colorful and kinda cool to see in the dull landscape of that day. 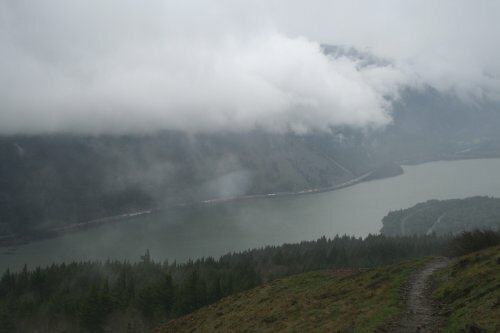 You can see here how close some of the clouds were to the elevation where we were hiking. All these photos are from the same mid-way viewpoint, but at the place where we stopped and turned around you couldn't see what was ahead at all because it was all covered by the fog. And it was SUPER windy. I was scared to even try to take out my camera, and even so there wasn't much to see because of the cloud cover. Sam was kind enough to take a photo of me for the record. Note the wetness. I was very wet and exhausted, but it was actually still fun. 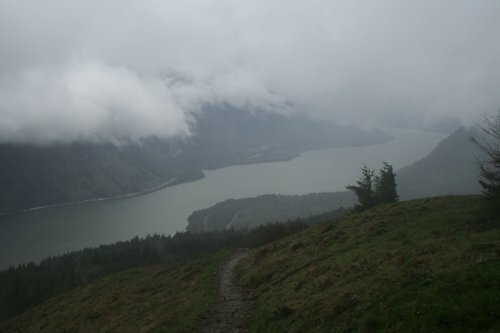 Hiking in those conditions was surprisingly a lot more fun than I expected it would be. Having decent rain gear helped, but yeah, it was a good experience. I definitely felt how out of shape I was though... I was sore for I won't say how long afterward. Here is Sam in the same spot. He had done this hike I think he said six times before, once with as much wind as we had this time. He was kind enough to go at my pace even though he could have gone a lot faster. I hope to do a lot more hikes with him in the future, hopefully getting in better shape for it each time.